While customers walked down the aisle, picking out fixtures for their home or office, young Rawson was behind the scenes, stocking inventory and doing different tasks. “As soon as I learned the alphabet, I was filing papers,” Rawson says. As he got older, he took on bigger responsibilities, like working on the store’s computer system and finding ways for the store to run more efficiently on the back end. He began to wonder what made businesses tick. What makes them run? 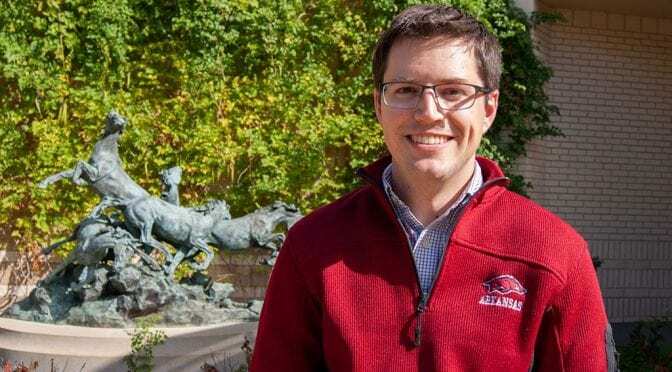 Years later, with a doctorate added to his résumé, Rawson and his continued curiosity arrived at the Walton College as an assistant professor with the Department of Accounting. His newfound interest in high school led him to take college accounting courses in his hometown of Las Cruces, New Mexico, and then at Colorado Christian University near Denver. Shortly before earning his bachelor’s degree in accounting, he took a course called Financial Statement Analysis, which ignited a passion for research. He discovered that analyzing financial information could lead him down different paths and new discoveries. When he learned that accounting research could be a profession, he applied and was accepted in a doctoral program at the University of Colorado in Boulder. My family consists of: my wife Sarah and me. My favorite museum is: almost any museum, especially if it’s air and space related! I can always be found with: a pen and a bottle or cup of water (blame it on growing up in the desert!). X-ray vision or magnified hearing? X-ray vision. As a Ph.D. student nearing graduation, Rawson attended a conference where he sat behind Kristian Allee, associate professor of accounting at Walton. Allee told Rawson about a faculty position available in the accounting department. Later, Rawson got on the internet and researched as much as he could about the University of Arkansas and Northwest Arkansas. “I showed Fayetteville to my wife, and she was instantly impressed,” he says. Rawson applied for the job and was invited for a visit. He immediately found the faculty to be friendly and intelligent. “The interaction between faculty and Ph.D. students was a big draw,” he adds. He knew where he wanted to be. “I took this offer before I went on any more interviews,” he says. Rawson teaches Intermediate Accounting II to undergraduates and has also begun projects with the department’s Ph.D. students. He says he particularly enjoys seeing his students have “light bulb” moments when learning about accounting. And, of course, there’s the research. Whereas accounting often involves financial capital, Rawson is also interested in how firms report their intellectual capital and intangible assets, such as their employees’ intelligence and other aspects that don’t have specific monetary values. For example, he and his co-authors studied whether CEOs who have been unemployed before taking the job end up having better or worse fits at the firms that hire them. They found that previously unemployed CEOs earn less during their first year but didn’t find that simply being unemployed leads to worse employment outcomes. Their findings were published in the Journal of Accounting Research. Rawson also pays attention to how CEOs of public companies describe their firm’s investment activities. By paying attention to their choice of words, he believes it’s possible to interpret what’s actually happening. He then compares his interpretations with public data he has collected about the firms’ future performances. Rawson says this information can be useful to companies on how to be informative to the public in a manner that isn’t harmful to their firms in the long run. When not working, Rawson enjoys hiking and canoeing, attending performances at Fayetteville’s Walton Arts Center and visiting Crystal Bridges Museum of American Art in Bentonville. “It’s been a lot of fun exploring the area,” he says.